Snacking has become an established part of everyday routine around the world with a growing number of people eating frequently throughout the day instead of sticking to a set schedule or menu. People snack for many reasons and often it’s not because they’re hungry. Some are bored, fatigued, or stressed. Others prefer the smaller size of snacks compared to large meals or they may eat one or more snacks because they don’t have time for a meal. Snacks bring pleasure with their many different flavors and textures. Interestingly, a lot of people name nutrition as the top reason for eating snacks. The term snack can refer not only to the act of eating between meals but also to the types of foods eaten. Traditional snack foods – crunchy or chewy foods that are high in nutrients to limit such as fat, salt, and/or sugar, and low in fiber, protein, vitamins, and other good-for-you and better-for-you nutrients – do not have a particularly good nutrition reputation. That is changing as the market grows for traditional snacks with a more healthful profile. 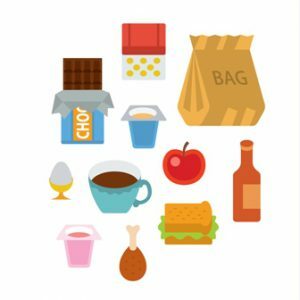 Whether snacking is good or bad depends on several factors, including the types of foods a person chooses. Fruits, vegetables, cheese, yogurt, or other nutrient-dense foods are preferable to energy-dense, nutrient-poor cakes, cookies, or chips. Healthy snacks can help by filling in key nutrients such as protein, fiber, and calcium that might fall short in main meals alone e.g. an older person or convalescent with a reduced appetite. Snacks with higher percentages of calories from fruit and nuts, for example, have been shown to improve diet quality while calories from desserts, sweets, and sugar-sweetened beverages have the opposite effect. Snack calories matter. Snacking can offer a benefit to those who cannot meet their calorie needs in three meals alone, including young children, older adults, and athletes. People who get enough calories from meals, however, can exceed their daily calorie needs if they are also consuming calorie-dense snacks. Snacking does not have a consistent relationship with body weight in adults or children. There is conflicting data to support the theory that snacking leads to higher total body fat. The type of foods chosen and level of calorie contribution from snacks may matter. Replacing traditional snack foods with nutrient-dense choices such as fruits, vegetables, low-sugar dairy foods, and some snack bars could increase nutrient intake without negatively impacting calories. For those snacking out of hunger, satiating snack foods are highly desirable. Some snack foods are more filling than others. Yogurt, for example, has been shown to suppress hunger and dampen appetite for the following meal. Other high-volume, low-energy-dense foods such as broth-based soups, salads, cereal with lower fat milk, can also satisfy hunger. Protein, whether in dairy products, meat snacks such as jerky, or higher protein snack bars, can be more filling than sugars and refined carbohydrates. Consumer demands are continuously evolving and they are now looking for snack foods that are natural, “free from” artificial colors and flavors, preservative-free, and non-GMO. 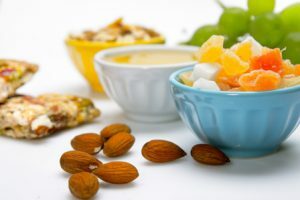 Snackers also look for fiber, protein, whole grains, and “energy” and often look to dips, meat snacks, refrigerated dairy products, fresh fruits and vegetables, and nuts for healthier snack options. The industry is responding with a growing number of better-for-you snack foods that are lower in total and saturated fat, sodium, and/or sugars; have no trans fat or artificial ingredients; and have higher levels of protein, fiber, and other nutrients. Include fruits and vegetables, whole grains, and lean animal and plant proteins, along with lower-fat dairy products, and nuts and seeds. Choose foods with a high nutrient density and low calorie density. Fill in nutrition gaps with snack foods high in calcium, fiber, protein, and/or vitamins and minerals. Limit foods that are high in fat, highly salted, sugary, and low in healthful nutrients. Limit night time snacking, including snacking in front of a screen. Plan ahead for healthy snacks on-the-go. Mindy Hermann, MBA, RDN, specializes in food and nutrition communications for the industry, health professionals, and consumers. Mindy Hermann is a popular speaker and author on healthy eating at all ages. She served as a spokesperson for the Academy of Nutrition and Dietetics and frequently appears on national and local television.